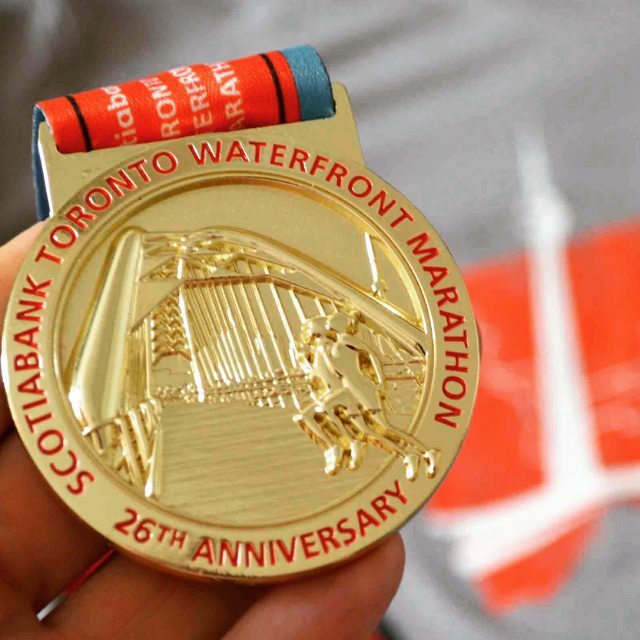 Six months ago, partly by fluke and partly due to my ever-growing social media addiction, I had the good fortune of being selected for the Digital Champions team for the Scotiabank Toronto Waterfront Marathon. I had been on the fence about running another marathon; my debut marathon (at Scotia, the year before) could more accurately be referred to as a death march. 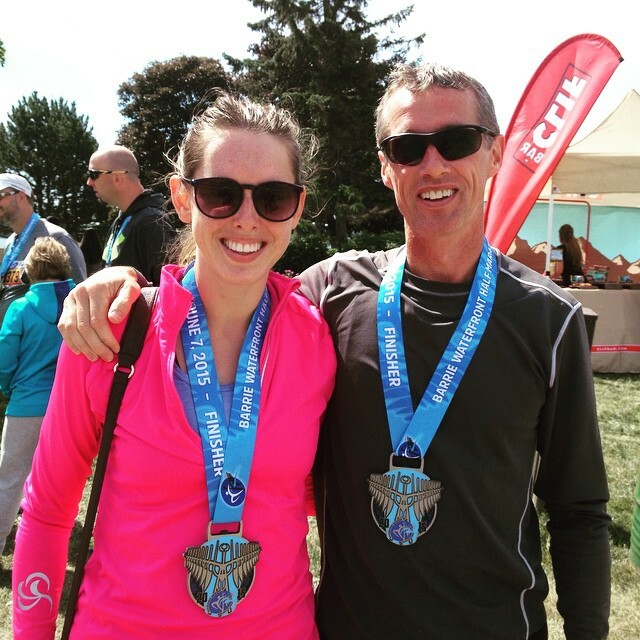 I didn’t run my first marathon in 2014; I survived it. I love long runs. I can lace up my shoes and get lost out there for hours. 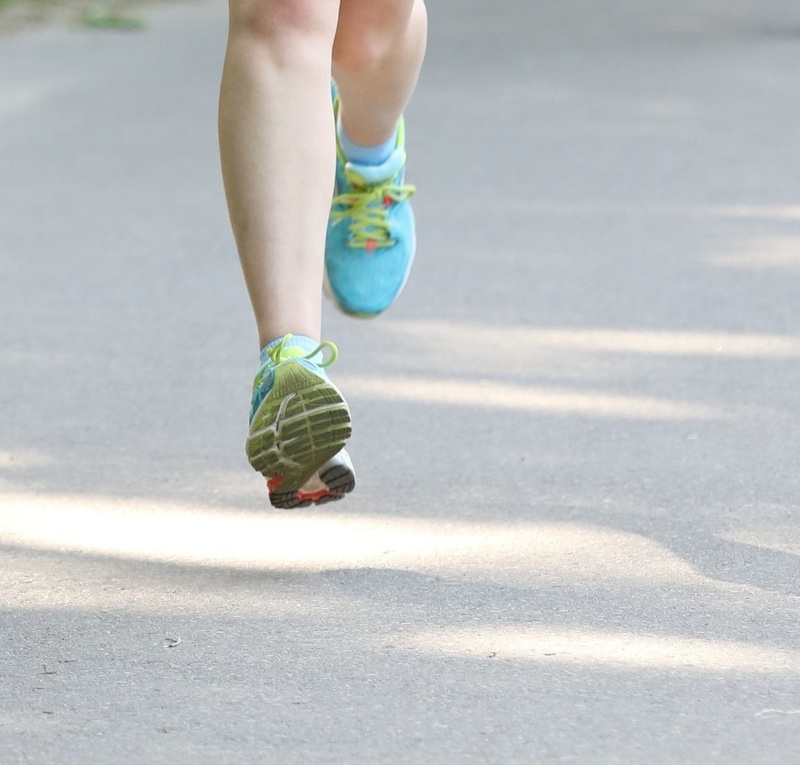 In training, the miles never wear me down – they just melt away. As a result, I had always thought the marathon was going to be my distance. 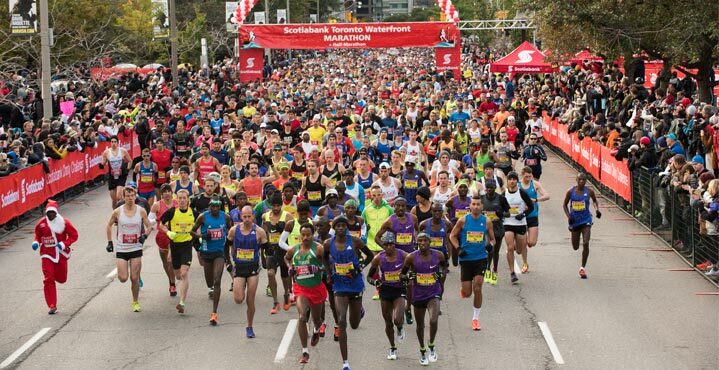 But at Scotia 2014, it gutted me, and the idea of lining up for a redemption marathon became terrifying. When I applied to be a Digital Champion for Canada Running Series, I thought I was letting fate decide. I reasoned that if they picked me, it was a sign. If they pick me, I’ll run. Terrified, but feeling I was in no position to argue with the whims of fate, I enlisted the coaching of the best runner I know: my dad. 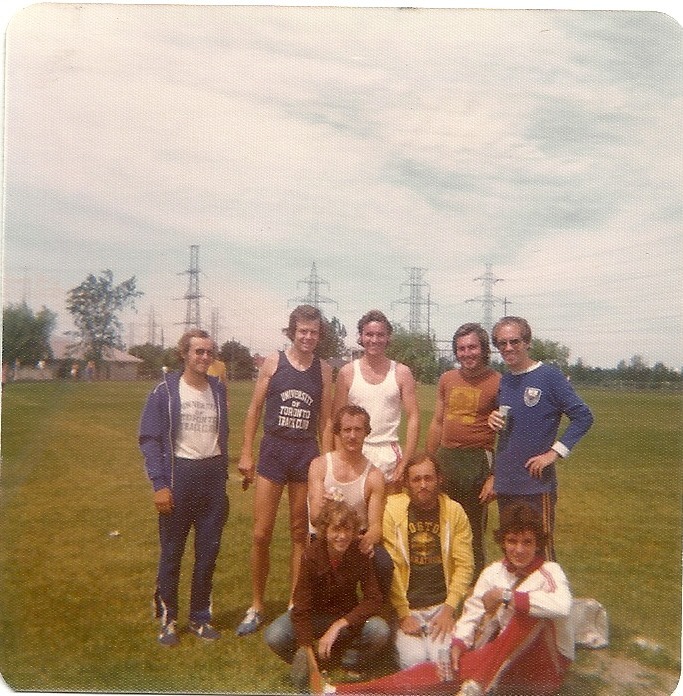 Vince Friel has been a dedicated distance runner for the better part of my life. He’s represented Canada in the World Masters Track and Field Championships, clocked a 4:02 1500m, and run under three hours in the marathon. But more importantly, he raised me, and is intimately acquainted with the fact that I am (to put it bluntly) a massive wuss. I have a fragile little ego that doesn’t respond well to “tough love” coaching. I can’t be pushed to face a challenge; I need coaxing, encouragement, and positive vibes. And my dad is one of the most ridiculously positive people I know. Armed with the Coach Vince training plan, I’ve spent the last six months preparing for October 18th. My easy runs became easier, my long runs longer, and my speed work… existent. Apparently if you want to run fast, you have to practice running fast. Who knew? With Coach Vince adding structure and accountability to my training, the workouts began to feel increasingly comfortable. In the final few weeks leading up to the race, he had me running tempo runs at marathon pace, and to my surprise, they rolled right off my back. But I hadn’t survived the marathon death march of 2014 without learning a thing or two. It wasn’t enough to be well-trained: I knew I would need a racing plan. For that, Vince reached out to one of Canada’s best marathon coaches, Timo Uuksulainen. Timo is one of the founding members of the Longboat Roadrunners, and used to run with my Grandpa Jack Friel back in Jack’s marathon glory days. My strategy was simple: I was going out there to run three consecutive 10K tempo runs. I was going to stay on pace until 30K, after which point I had permission to race as I pleased. I will tell you this much: staying locked into my planned 4:42/km pace from the gun was not easy. In the first two kilometers, it felt as though the entire red corral passed me. I felt like I was going way too slow – until I ran through the 1K marker and caught my first split: 4:21. Way too fast. I resolved to tuck in and run easy, clearing the next few K-markers right on pace. When I hit the 10K mark, I stopped my watch, re-set it, and started again from zero. This idea came from an interview I had read with Canadian record holder Lanni Marchant, when she talked about taking the marathon 10K at a time. After the pain of last year, I couldn’t face up to running the full 42.2K distance, and in my mind, I wasn’t; this was just another 10K tempo run. Just like in training. The first 20K breezed by; between the neighborhood cheering squads out there on the course and the excitement of watching the elites blow by at the turn-around points, I was able to stay on pace and keep my mind off of the miles to go. When we reached the bottom of Bay Street, and the half-marathoners split off to run for their finish line, something incredible was waiting for us: the Parkdale Roadrunners cheer squad. There’s a special place in my heart for the people who come out to watch marathons. It’s a thankless spectator sport, and yet there they are, lining the streets in the freezing cold, shouting encouragement at a stranger. The cheering stations on the Toronto course are always amazing, but let me tell you, that Parkdale Roadrunners cheer squad was something to behold. 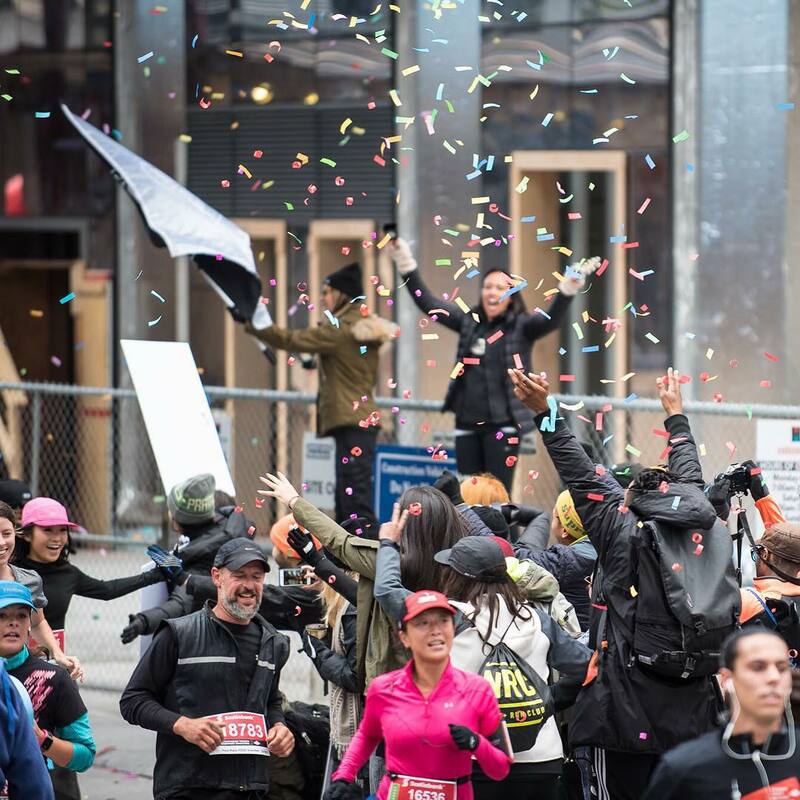 Running through a vortex of screaming, cheering, cow-bell-ringing crazies, holding hilarious signs and throwing confetti, I felt like I was an elite running in a World Marathon Major. It was some serious, next-level awesomeness. I had expected to come through the halfway mark just north of 1:39; a small PB for me, but not entirely unexpected, given how infrequent and under-prepared my half-marathon attempts have been this year. I ended up clearing it in 1:37:53. I was excited (especially since, thanks to the Real Time Run Tracker, I knew my family at home would catch my split), but also vaguely worried. In the marathon, you can bank effort, but you can’t bank time; running faster than your goal pace early in the game is only going to cost you twofold on the back end. I learned this the hard way last year, and was not about to make the same mistake again. So I tucked in and resolved to run easy up and down the “pretzel” section of the course on Bayview Drive. When I hit the 30K marker, I once again re-set my watch. The tempo runs were over! This was the point in the race that I had been pacing myself for – after 30K, I had given myself permission to start racing. Only now, I didn’t want to. Timo was right: the 4:42/K pace, which had felt easy, almost pedestrian in the early kilometers, was beginning to take some effort. My body was holding up, but mentally I felt fatigued. I was no longer in the frame of mind to race. So I did the only thing I could think to do: I started my watch again and zero, and tucked in for another 10K tempo. Just like in training. My left foot was the first to go. My right quad started to ache; the left one quickly followed. At 34K, my core was shot. At 36, my neck sort of rolled back on my shoulders, and my head started bobbing with every step. I must have looked ridiculous. Actually, I’ve seen my race photos, so I know I looked ridiculous. With every kilometer, the effort needed to sustain my pace seemed to double. But something incredible was happening: I was holding the pace. I was hurting. I was fighting. I was running like some kind of demented marathon zombie, and I think at some point I might have peed a little. But I was holding on. Somewhere in all those months of training, something deep within my physiology had shifted, and I realized that this course, which had gutted me the year before, just couldn’t break me anymore. By the time I hit 40K, I couldn’t make sense of my splits anymore. My body had given out, bit by bit, and now my mind was starting to go. I vaguely registered the 3:08-something on the clock, and knew I was within the Boston Qualifier window, but I didn’t trust my body to hold out over the next 2K. Nothing was certain until I crossed that finish line. At the flatiron building, my sister Alex and roommate Ashley, both amazing runners in their own right, cheered me past. Ashley screamed something at me about 3:19, and I was elated. If I was at 3:19 right now, that means I’d bring it home somewhere in the low-3:20s. The run up Bay Street in that final stretch to the finish was a vortex of screaming, cheering, electrifying loveliness. One of the coolest features of the Toronto Marathon is the slight bend in the road about fifteen feet from the finish line, which obscures the finish clock from view until right before you cross. As I rounded the bend, I realized that Ashley hadn’t been shouting my time at me – she was shouting my projected time. I crossed the line in 3:18:33 – a PB of more than 20 minutes, a Boston Qualifier, but most importantly, a race effort I could be proud of. I started to cry in the finishing chute, which seriously creeped out a lot of the race volunteers. I couldn’t help it – like I said, I’m a giant wuss. It’s not often you get the opportunity to go back and rewrite your past mistakes, but it feels like that’s exactly what I did on Sunday. The 2014 marathon defeated me in every way possible – mentally, physically, and emotionally. In 2014, I ran out of my depth, without a plan, without proper training, and I ended up broken. In 2014, I gave up. This year, I came prepared. I trained hard, ran a controlled race with a clear strategy, and didn’t let my ego get in the way. And more than that, I had fun. Even when I was hurting over those last few miles, I really was having the time of my life. It’s going to be a while before I return to the marathon. Boston 2017 is on my horizon, and until then, I’ve resolved to focus on the short stuff. But I’m happy knowing I was able to make such a positive memory with the marathon distance. I’ve always known that I was born to run the marathon. Last year made me doubt all that, but after Sunday, I feel like I’ve finally managed a passing grade in Marathon Theory 1000. Second time lucky, I guess. Congrats on the amazing time, PB and BQ!! I really enjoyed reading this race report, Amy. I feel like I learned a lot about how I should break down my next race from your own experience. 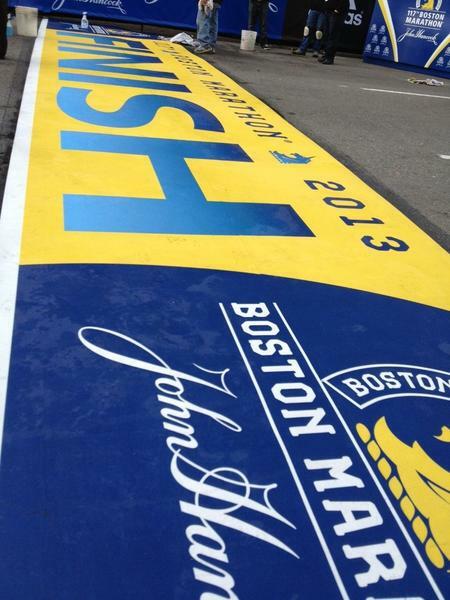 I’d love to hear more about your training one day as your finishing time is my target to lock in a BQ! Congrats on the massive PB and awesome BQ! congratulations again on your bq! and thank you for a race report that’s both beautifully written and super helpful. so many tips to bank!